If you, like many of us women out there, suffer from thin hair that lacks in volume and takes forever to grow when you’ve cut it, dont worry – we hear you girl! It can be really hard to find products that help in giving your hair that growth and simulation that it needs to get your hair looking fabulously lush! Plus, there are so many products out on the hair care market nowadays that it can be quite a daunting task to find a hair care range that gives your hair the real care and nutrition that it needs, without causing it any damage from nasty chemicals. We loved this Growth Densifying Shampoo, it really cleanses the scalp and creates a naturally clean and healthy looking glow to your hair, and we were so in love with the fresh and yummy smelling fragrances infused in this shampoo which created the scents that you would get in botanical gardens, plus that gorgeous smell lasted all day, and all night long. The nourishment that his shampoo has is also very apparent from the very first wash, which is probably because of the natural sources from which they extract their ingredients form, including grape seeds and pea sprouts! 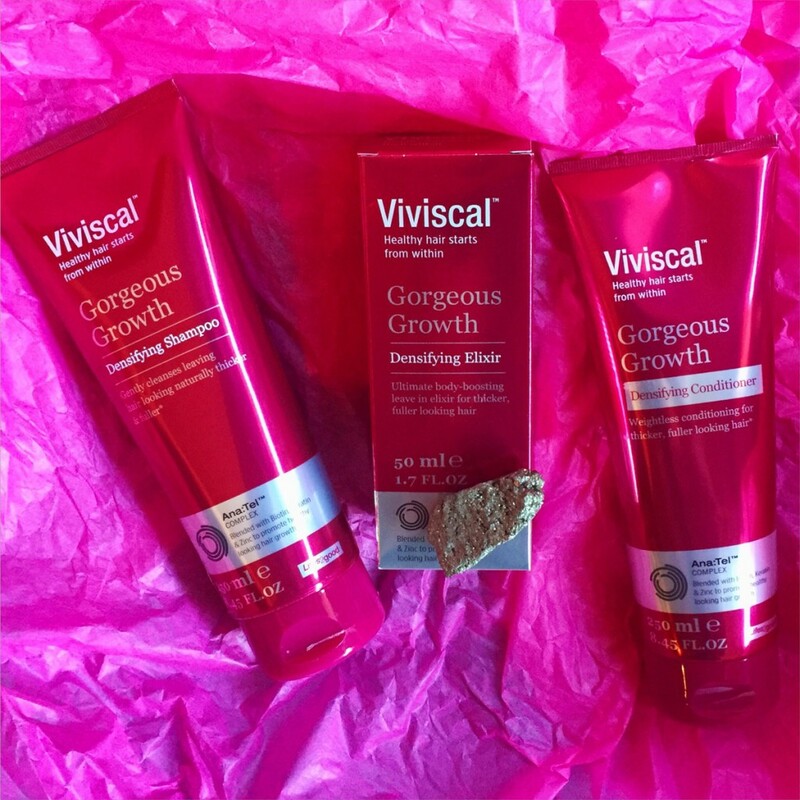 Again, another absolutely yummilicious smelly product from the VIVISCAL® GORGEOUS range is definitely their Growth Densifying Conditioner, which we would recommend using in conjunction with their shampoo, and although this is a pretty lightweight conditioner, you’ll feel the thickness and volume that it adds to your hair instantly! With Biotin, Zinc and Keratin all part of this gorgeously delicious smelling conditioner, you can rest assured that your hair and scalp are getting the nutrition and care that it needs, especially if you have thin hair. If you’re looking for something that will give your hair that extra boost of volume and confidence that it needs then this is the absolute ideal product for you! The non-greasy formula has been perfectly developed for thin hair that lacks in volume and is very simple to apply to your hair. Its 100% drug free and will leave your hair looking as if you’ve just stepped out of the salon. Plus at such a great price, this Growth Densifying Elixir will promote healthy growth and last you an entire month!